Receiving an electronic fax through AirComUSA is easy. When you register, we will assign you a fax number. Depending on your preference, you can receive a toll-free fax number, a toll fax number, or a combination of toll free and toll numbers. 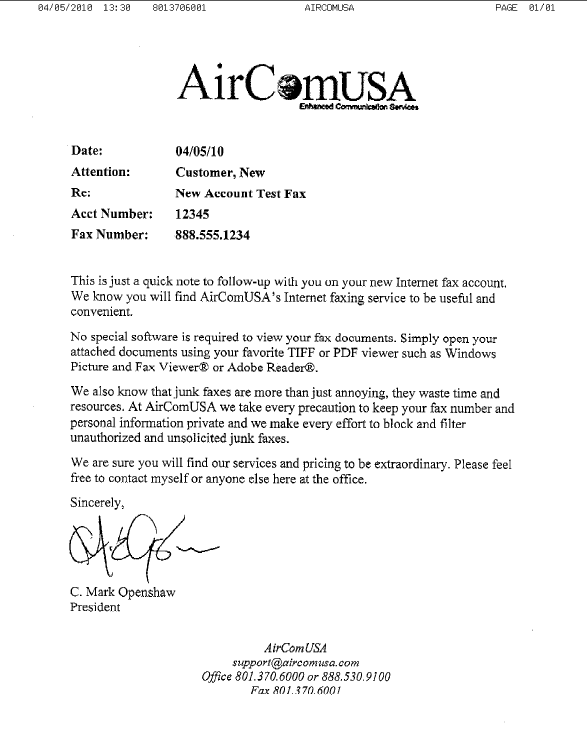 When someone sends you a fax on one of your AirComUSA fax lines, using electronic fax technology we convert the faxed pages to .tif files, attach them to an email, and send that email to the email address you provided when you registered. To view the faxed documents, open the email by double clicking on the email in your Inbox. The faxed document is attached to the email as a tif or pdf file. Open this file to view the fax. Double click on the .tif files. Unless you have configured your PC differently, they will automatically open in your default fax viewer. For XP this is Windows Picture and Fax Viewer. For vista the program is called Windows Photo Gallery.